The New York Times published this rather startling headline today, "Obesity Rate For Young Children Plummets 43% In A Decade." Wow. This is good news. It's time to break out the margaritas and guacamole dip. In fact, the news is so good that it immediately raised my suspicion of its authenticity. Societal changes in health don't usually demonstrate such drastic changes in so short a time as ten years. Chronic human conditions like obesity and smoking take decades and generations to show any meaningful differences. Naturally I delved deeper into the article. The paper was trumpeting the results of a survey published in JAMA that was conducted by the CDC. The government agency measured the heights and weights of 9,120 individuals, including infants and toddlers, in 2011-2012. They then compared the results to similar measurements made in the last ten years. For this latest survey they noted that an elevated weight vs. height ratio above the 95th percentile, indicative of obesity, was found in 8.1% of infants and toddlers, 16.9% of 2-19 year olds, and 35% of adults older than 20. Hmm. Those numbers don't sound that different from the background information written in the very first line of the article, that one-third of adults and 17% of youth are obese and haven't changed from the 2003-2004 period to 2009-2010. To find ANY good news in the data, you have to finely parse the data into a tiny cohort of 2-5 year olds. There, the CDC discovered that obesity rates had dropped from 13.9% to 8.4% or 39.5%. To reach the hyperventilatory number of 43%, the NYT rounded the numbers to 14% and 8% which will give the 43% reduction in its screaming headline. Naturally the liberal mouthpiece that is the NYT immediately attributed this bit of good news to Michelle Obama's programs to combat obesity. Since she has only been First Lady for the last six years, the reduction in obesity among five year olds fits nicely into this theory. Mrs. Obama becomes First Lady, starts a war on obesity, and wouldn't you know it a quick five years later kids are losing weight left and right. While I admire Mrs. Obama's public service trying to decrease the obesity rate in America, these numbers don't come anywhere close to proving that our country has turned a corner. First of all, a survey of 310 million Americans by measuring a measly 9,120 individuals sounds awfully selective. And then to single out an even smaller number of individuals in a certain age bracket makes the results almost meaningless. That's like saying Americans have now forgone gas guzzling cars because out of hundreds of millions of vehicles on the road, a few people are buy Teslas. The way the huge reduction in obesity was calculated also doesn't make sense. It's true that eight is 43% less than fourteen. But is that how those numbers should be computed? I would think that a more accurate way to properly arrive at the results is to start with the statement that fourteen out of one hundred people were obese. Now there are only eight out of one hundred. While any abatement in the growth of obesity is welcome, suddenly the new numbers don't sound so impressive anymore. Finally, one only has to read the journal article itself to see that the researchers do not find much to celebrate in their survey. Under Conclusions and Relevance, the authors wrote, "Overall, there have been no significant changes in obesity prevalence in youth or adults between 2003-2004 and 2011-2012." So as the NYT continues to do the cheerleading for the floundering president, one must be vigilant to propaganda masquerading as a news headline. Masking A Patient. The Magic Number Is Fifteen. In anesthesia residency, we were all taught how to gently induce anesthesia and intubate a patient. First we put the patient to sleep with the induction agent of choice, usually propofol. Once the patient was asleep we ventilated him with a face mask to be sure it could be done easily. When that was ascertained, then we gave our muscle relaxant to paralyze the patient for intubation. Masking the patient usually took about 90 to 120 seconds because we avoided using succinylcholine unless a rapid sequence intubation was desired. The reason we tried not to use sux was because of all its possible deleterious side effects, include hyperkalemia, malignant hyperthermia, and increased intracranial pressures. Plus patients frequently complained of whole body muscle aches during post op checks. Now during those two minutes it took for the nondepolarizing muscle relaxants to work sufficiently for intubation, we had to mask the patient to prevent hypoxia. While doing this, we kept an eye on the peak airway pressure that was being applied to the patient. The magic number was 20 cm H2O. It was taught that using any more pressure to ventilate the lungs will also drive air into the stomach, distending it and possibly causing an aspiration. So we vigilantly looked at the pressure gauge to keep it just below the magical 20 line. Yet, no matter how careful I was, once the surgeon looked inside the abdomen during a procedure like a laparoscopic cholecystectomy, he would complain that the stomach is distended and I needed to drop in an orogastric tube to suction the air out. This isn't always easy to accomplish. The tube can be difficult to pass into the esophagus in the first place, coiling around itself in the mouth. Or it can get obstructed by a hiatal hernia in the lower esophagus. Or it can cause gastric mucosal bleeding from the suction during the case. Therefore placing an OG tube should not be taken lightly and, as with everything else we do, can be fraught with complications. I always wondered how accurate that teaching of 20 cm H2O was. Now there is a study that lends credence to that age old dogma. In the February issue of Anesthesiology, researchers induced volunteers with propofol then ventilated them at peak airway pressures of 10, 15, 20, and 25 cm H2O. At the same time they used a stethoscope to listen for gastric air and an ultrasound to look for gastric distension and measure the size of the antrum. What they found was that the stomach did distend in proportion to the pressures applied to the face mask. By listening to the stomach, the researchers found incidences of gastric insufflation ranging from 0% in the P10 group up to 41% in the P25 group. When visualized using the ultrasound, gastric insufflation went from 19% in P10 up to 59% in P25. The antral area when measured by the ultrasound did not significantly increase in size in the P10 and P15 groups while it was significantly increased in the P20 and P25 groups. How well did the patients ventilate at these different pressures? As you would expect the greater the driving pressure, the higher the tidal volumes. With P10, the tidal volumes were only about 6 ml/kg. Tidal volumes were measured between 8 ml/kg and 12 ml/kg for the P15 and P20 volunteers. When the masking reached P25, the volumes shot up to 14 ml/kg. Based on these results, the authors concluded that masking a patient up to 15 cm H2O gives a patient the greatest lung volumes with the smallest risk for gastric distension and aspiration. So my old attendings' lectures were not that far off. However, all of this would be moot if we could discover a nondepolarizing muscle relaxant that works as fast as sux without its side effects and dissipated just as quickly. Rocuronium currently comes the closest in rapidity of response. However it cannot be used in short cases due to its prolonged action. That is why the FDA's continued refusal to approve roc's reversal agent sugammedex is so disappointing. It has been used in Europe for years yet we can't get our gloves on it here. I wonder how many MH and other complications of sux could have been avoided in all these years if sugammedex had been approved for use in a timely manner. So in the meantime, keep masking those patients. Just keep it at 15 cm H2O or lower. Poor Elon Musk. The billionaire founder of the highly successful electric car company Tesla Motors and the commercial space transport service SpaceX must be slapping his forehead raw when he realized what a fool he has been trying to make his next billion dollars. He has been struggling for years to create the Tesla Model S. This required him to buy an actual car factory and hire thousands of people to work in it. He has had to practically reinvent the battery industry to power the thousands of cars that needed to be sold to make the whole enterprise work. He's had to follow gazillions of government regulations before he could put a single car on the road. Mr. Mush has had to put up with hack car journalists who had no idea about how to properly drive an electric vehicle. For all those struggles and headaches, what does he have to show for it? Tesla Motors has a market cap of only $25 billion. Now comes word that Facebook is buying a phone app called WhatsApp for $19 billion. That's $19,000,000,000! This is a company that has practically zero revenue because its service is almost free (it recently started charging 99 cents per year). It has only 55 employees. And it was begun a mere 5 years ago. This obscene price makes WhatsApp more valuable than such diehard Fortune 500 companies like Alcoa, Harley-Davidson, Gap, and Southwest Airlines, companies that, you know, actually make money and employ thousands of people. I still can't wrap my head around the idea of somebody paying billions of dollars for a company that is giving away a free service that nearly all cellphone users get as part of their phone contracts anyway. It's hilarious reading about how Facebook was able to justify the price. Basically it all comes down to the eyeballs. Or specifically the 450 million people who use the app every month. It has more users than the much vaunted Twitter which has a market cap of $31 billion. Therefore Facebook got a steal of a deal, right? WhatsApp also has a younger demographic of users, which Facebook is desperately trying to retain as the old folks move in who are trying to locate their long lost high school sweethearts. It also has more international exposure than FB and its rate of growth is still climbing as FB starts to moderate. Somehow I can't help but think that all these excuses sound awfully similar to the dotcom stock bubble that occurred a mere decade and a half ago at the turn of the millennium. Back then people were pumping up stocks with names like Pets.com, Webvan, and inktomi. These were all companies that were worth billions of dollars but had little revenue and huge red ink in their books. Yet due to their ability to attract people to their websites, they were considered the next great American companies. After all, the capability to manufacture actual products in this country is so 20th century. Perhaps the now billionaire founders of WhatsApp are the new Mark Cuban, who sold Broadcast.com to Yahoo for billions of dollars right at the peak of the tech bubble. Or maybe they are the new Kevin Systrom and Michel Krieger, the founders of Instagram who sold their company to Facebook for a mere $1 billion back in 2012. If Instagram had only held out for another twelve months, they could probably had gotten at least five to ten times that amount. So Elon Musk, we doctors can sympathize with you. We too put in years of hard work and have to put up with all sorts of government regulations and unfair criticisms. But like you all our efforts are underappreciated as more glamorous industries come along and grab all the money and fame. These young whipper snappers think they will rule the world with their small offices of overworked programmers who give away the fruits of their labors, contributing practically nothing to our GDP. Yet the real world requires people like us who toil day in and day out so that the world will be a better place. So Mr. Musk, you and I should get together and drown our sorrows in a few glasses of suds. You can arrive in your six figure car while I show up in my eleven year old Honda. I may even pick up the tab. At least that appears to be the case in laboratory mice. In this month's issue of Anesthesiology, researchers from Japan published a paper detailing their experience after giving six day old mice sevoflurane for six hours. Previous studies had demonstrated increased rates of neuronal deaths in young brains that have been exposed to general anesthesia. After 7-9 weeks, the mice were then mated to other healthy mice and the resultant parental behaviors toward the new offsprings were documented. The results gave a rather stark demonstration of the latent effects of anesthesia on brain function. The control mice cared and fed their brood normally while the mice that were given sevoflurane showed a severe lack of maternal instincts. While 80% of the pups from the controls were well fed, only about 40% of the pups from sevo exposed mothers were fed. The nesting instincts were also severely impaired. When the pups were randomly scattered around the cage, the control mice would retrieve all of them back to a central nest so they could be fed and kept warm. By contrast, the sevo mice took a much longer time to bring back the pups, frequently leaving them exposed throughout the bottom of the cage. Consequently, as one can imagine, the survival of the pups were much different between the two groups. The pups from the control mice had an 80% rate of survival after 6 days. The sevo exposed mice had half of their pups die after only 2 days. To test whether the effects of sevoflurane on maternal instincts can happen to adult mice, the researchers gave the anesthetic to mice who had just delivered one litter of pups. They found that the offsprings from subsequent pregnancies had no significant difference in care or survival compared to the controls. Thus it seems that sevo only made its impact on developing brains, not mature ones. 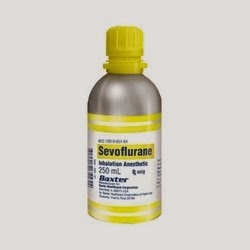 This study raises the potentially alarming question of the use of sevoflurane in human brain development. The anesthetic was first approved for use in the early 1990's. It quickly became the standard for inhalational induction in pediatric patients due to its rapid onset and low airway irritability. Many of those children are now young adults and of child bearing age. It will be interesting to follow up on the patients who received sevo for surgery twenty years ago and test them for their parenting skills and their children's developments. Will we see a surge of poorly raised or abandoned children in society? Only time will tell. After practicing anesthesiology for many years, I've developed a list of observations and advice that I think will help anesthesiologists or anyone thinking about going into the field. Obviously most anesthesiologists probably have already reached the same conclusions as me. But passing around some common nuggets of knowledge that isn't found in any anesthesia texts will surely help. 1. Never trust a surgeon. If you think a case might produce a lot of blood loss but he says there will be minimal EBL, always draw up some blood to send to the blood bank, just in case. The little bit of extra time and cost put into that effort won't be missed and could potentially save a patient's life. Otherwise when you need the blood, as you eventually will, you will have poor access to draw a specimen and it will take the blood bank 45 minutes to get the blood ready. 2. If you are even thinking about intubating a patient for a procedure, just do it. Inevitably the patient will get into respiratory difficulties during the middle of a case and you'll have to scramble to get an endotracheal tube inserted, sometimes in an awkward position with poor visibility. If the patient got intubated before the case started and the case proceeded smoothly, then at least the patient got the safest anesthetic and airway protection you could provide. As one of my residency attendings once said, he would declare that a victory. 3. Don't make enemies of the nurses. They will always have more power and influence than you. They can make or break the OR schedule while you, the anesthesiologist, is easily replaceable. 4. Invasive monitoring is your best friend. Don't hesitate to put in an arterial line or central line just because you don't feel like doing a little extra work that morning even though the patient has all the indications for needing one. Patient safety is numbers one, two, and three in how we practice anesthesia. 5. You should be as proficient with a fiberoptic intubation as a direct laryngoscopy. Sometimes even a video MAC is not effective. I had a patient recently who came in with Ludwig's angina who could barely open his mouth more than one centimeter. No video MAC could have intubated that patient. 6. If you are running late for your next case, inevitably the patient will have no veins to start an IV. 7. When a surgeon says that only a MAC anesthetic will suffice, he really means he wants the patient as motionless as a general anesthetic. 8. If you have an important engagement to attend to after work, invariably the last patient of the day will crump in the recovery room. You will be stuck there for the next two hours reviving the patient while your spouse sits at home fuming over another missed birthday dinner and thinking she should have married the future Goldman Sachs banker who tried to woo her in college. 9. You can do 99 perfect anesthetics in a row but it will be the one patient that has a complication (broken tooth, aspiration, MI) that people will remember and you'll lose your sleep over. You'll get called to a hospital Quality Assurance meeting and get raked over the coals and feel like a total anesthesia impostor. 10. And finally, just to keep us humble, remember that when a surgeon is running 30 minutes late for his case there is nothing you can do but sit back and cool your heels until he arrives, usually without an explanation for his tardiness nor an apology. However if the anesthesiologist is 5 minutes late, there will be a huge outcry from the surgeon to find another anesthesiologist. An interesting op-ed appeared in the Wall Street Journal the other day. The author was describing the occupations of the top one percent of income earners in this country. To qualify for inclusion in this elite group, a person would need to have an annual income of at least $307,000 in 2010. In the entire country, about 1.1 million tax payers fit the description of the top 1%. He breaks down those 1.1 million tax filers further and noted that 30% are business executives, 14% are physicians, 13% are in the finance industry, and 8% are lawyers. From those numbers, we can roughly estimate that there are about 150,000 doctors who are in the top 1% of wage earners in the U.S. Who are these doctors who seem to confirm the public's view about physician wealth? This is where the math points to how widespread the discrepancy is in income between primary care doctors vs. specialists and why medical students increasing shun the former. Let's do the math. Again in 2010, there were about 625,000 practicing physicians in this country. Out of this total, about 209,000 are PCP's, or roughly one third the total. How much money do these PCP's make? According to the last Medscape Physician Compensation Report for 2013, the average income of internists was $185,000 while family practitioners made about $175,000. In both groups, less than ten percent of the doctors made more than $300,000, or the coveted top one percent. So out of 150,000 doctors in the one percent, only about 20,000 are in primary care. Though PCP's are one third of all doctors, they make up about 13% of the top one percent. Now let's take a look at the specialists who dominate that top tier. Anesthesiologists, according to the Medscape survey, have a mean income of $337,000. Fully two thirds of anesthesiologists make more than $300,000 per year. Gastroenterologists make about $342,000 and over 50% make enough money to put them in the one percent. Radiologists make an average of $349,000 and about two thirds will populate the ranks of the top one percent. In other words, of the roughly 415,000 specialists working in this country, about 130,000, or 30%, will make enough money to earn them the scorn of the liberal wage redistributionists. More startling, they make up 87% of the doctors who are in the one percent. Though we all like to think that we went into medicine to help others with little regard for our own financial security, ultimately life throws buckets of cold reality in our way. We suddenly realize we have student loans to pay, families to support, malpractice insurance to pay to cover our asses, and appearances to keep (like Archie Bunker once quipped, would you trust a doctor who drives a Plymouth?). The math makes crystal clear why primary care is hurting for more doctors. One of the most amusing, and humanizing, events so far during the Winter Olympics in Sochi did not even make it into the prime time airing of the opening ceremonies. As part of the preshow entertainment to warm up the crowd in Fisht Olympic Stadium, the Russian Police Choir performed a bang up rendition of Daft Punk's "Get Lucky." You can see the YouTube video above or a better quality video from NBC's Olympics site here. I don't know how long either videos will stay up so go take a look as soon as possible. I guarantee it will put a smile on your face. This goes to show that despite all the rhetoric about terrorist threats and human rights violations, most people in the world do not have a political agenda. Everybody just wants to get together and have a good time. If only our elected leaders can remember that and let their citizens be themselves then maybe our world can be a better place. I wonder if the Russian Police Choir will take a request for "Blurred Lines"?